Often, when we think about breast cancer detection, we think about annual mammograms, followed by waiting for results and turning to Google to get more information about results. Then we’re left searching for answers to questions about breast cancer: can it be prevented, am I doing something wrong, what do dense breasts mean for me, and so on. It becomes this vortex of similar content that can be hard to sift through to find things you didn't already know. It's hard to stay positive, too. By pulling together resources from a variety of sources, we’re able to think about breast cancer proactively. Featuring articles and advocacy groups knowledgeable about the breast cancer space; these guides provide information about breast cancer in an easy-to-understand and inspiring way. So, to help you break out of your typical breast cancer research process and hopefully share something new to provide peace of mind, we've compiled 7? of our favorite articles. Read them. You'll learn and maybe even share these resources with friends. And if you're itching to stay up-to-date on the latest breast cancer research, you can subscribe to our blog and receive weekly updates. Early Breast Cancer Detection – What’s the hype about? Finding breast cancer early is critical to a patient's overall success and health. While there are conflicting views on breast self exams, performing those maintaining regular mammogram screenings and seeking additional testing if indicated for you is an important part of annual breast care. Blood Testing for Breast Cancer – Your mammogram was abnormal, what's next? By utilizing a blood based approach to breast cancer detection, two different tests have emerged to help determine the development of breast cancer using blood. While these types of tests, commonly referred to as "liquid biopsies" pose incredible advances in breast cancer, it is important to maintain routine breast imaging as well. Examining the results of a recent study, which indicate a blood-based test could help physicians identify patients who are highly unlikely to have breast cancer after receiving an abnormal mammogram. Breast cancer patient management often times involves the primary care physician (or gynecologist), radiologists and surgeons – the utilization of a blood test to aid in breast cancer detection impacts the diagnostic process for each clinician differently. Dense Breasts – What are they and what does this mean for me? 4) Health.com: What is Dense Breast Tissue and How Does It Affect Your Health? Over half the country has legislation requiring physicians to inform patients of their breast density status. This can only be determined after receiving your annual breast imaging results. What makes dense breast tissue different than non-dense tissue? For women with heterogeneously or extremely dense breasts, the proportion of non-fatty to fatty breast tissue is higher. This is important because dense breast tissue appears white on mammogram and therefore may obscure cancers and potentially delay a breast cancer diagnosis. 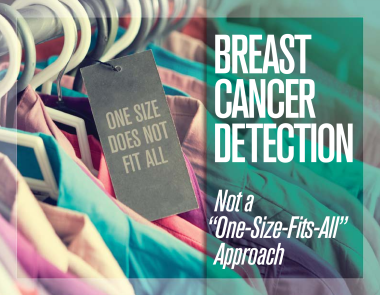 Early detection remains the "cornerstone of breast cancer control," when examining factors that may inhibit early detection, breast density is at the forefront. Dense breast tissue impacts breast cancer screening and relative risk for developing breast cancer. There is a higher incidence of receiving a delayed diagnosis and therefore being diagnosed at a later stage for women with dense breasts – particularly in women with dense breasts. Educating women on the risks associated with dense breasts is critical to improving care and outcomes. You Had A Breast Biopsy – Now what? 6) Health US News: How Do I Read My Breast Cancer Biopsy Report? For patients with an increased likelihood of breast cancer, a physician may order a breast biopsy to confirm whether a breast abnormality is benign or malignant. If the pathology confirms malignancy, the report will include information about the cell type, type of breast cancer, grade, hormone receptor status (indicates treatment options), as well as a physical description of the sample results. Which resource is most helpful to you? Do you have any other favorites not already on this list?